Learn how to become a DataCamp project instructor and have your project launch in January 2019. Hi, internet! DataCamp launches at least one DataCamp project a month that is topical for that specific month, and you (yes, you) should create one for January 2019. For example, in October, we launched a Halloween-related project called Explore 538's Halloween Candy Rankings by Nick Solomon. 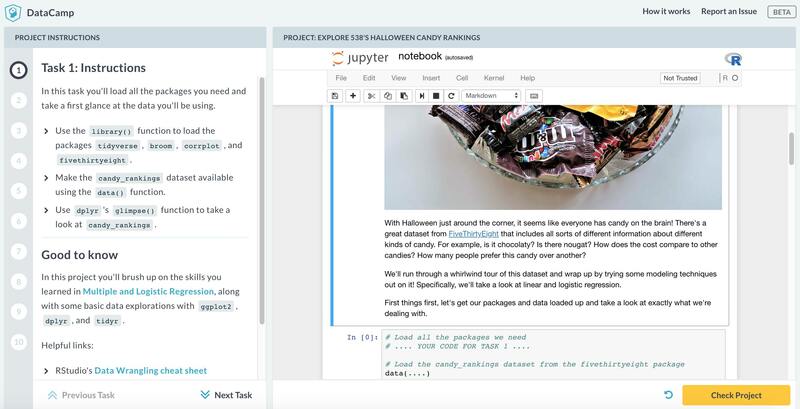 In that project, DataCamp subscribers can explore a dataset that contains information about all different kinds of candy. Is it chocolaty? How does the cost compare to other candies? How many people prefer this candy over another? The project wraps up by using linear regression to predict candy popularity and logistic regression to predict whether a candy is chocolaty or not. The first task in the Explore 538's Halloween Candy Rankings project. If you'd like more information on DataCamp projects, scroll to the bottom of this post. If you'd like more information on becoming a DataCamp instructor, check out these FAQs for creating DataCamp projects and these FAQs for creating DataCamp content in general. January is the month of started (and failed?) New Year's resolutions. "Predicting the success rate of new year's resolutions"
"New Year's resolutions: survivorship curves, scraping twitter data about them, etc." "New Year's resolutions theme. What are the most common? How soon are people to drop them?" War and Peace will be published 150 years ago come 2019. It is regarded as a central work of world literature and one of Leo Tolstoy's finest literary achievements. If you have a topical idea but don't want to apply yourself, post it in the comments. If you know of a great existing blog post, paper, etc. that covers something topical for January 2019, it can likely be converted to a DataCamp project so post it in the comments, and we'll reach out to the author. DataCamp projects are where students can apply several of skills they learned in DataCamp courses in real-world, end-to-end data analyses. If you're a DataCamp subscriber, take a look at our ever-growing project library, otherwise, take one of our free projects below. If you want more, this article outlines projects in detail and the pedagogical advantages of the product.